Welcome to the 2014 vExpert program and thank you for your contributions! The response this year has been amazing along with overwhelming but in a very positive way. It's been a pleasure emailing and chatting with many old and new vExperts. This year after appeals and late entries there are a total of 767 vExperts. the opportunity to finally get to meet local IT Pros like me, making me feel a lot more connected at VMworld 2012, with familiar faces in the crowds. The external vExpert directory is hosted at https://communities.vmware.com/vexpert.jspa. This is a public listing of the 2014 vExperts... Thank You, Corey Romero & The VMware Communities Team Be sure to follow @vExpert for program updates. joining the 767 other vExperts out there. Time for a new business card. Looking forward to the free jacket too, just in time for spring! Applications for the 2014 Q2 vExpert program are now open. Applications will be accepted up until June 8th at midnight PST. Applications received after the June 6th deadline will roll into the Q3 nomination & voting process. Recommend someone apply to become a 2014 vExpert: http://bit.ly/1bobFfF Geek Whisperers Podcast - A podcast that brings social media and community to enterprise IT, with VMware's John Mark Troyer, and the guy I happened to meet at a recent VTUG, Matthew Brender, along with the always insightful and equally witty Amy Lewis. Jacket hasn't arrive yet. Meanwhile, I made a post to the VMware Community Forum recently, and spotted the new designation. Nice touch! 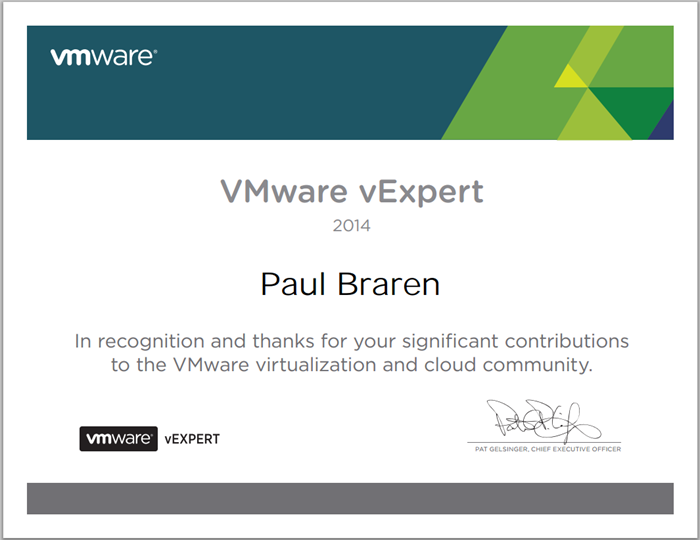 In recognition and thanks for your signficant contributions to the VMware virtualization and cloud community. Apparently Iceland has the highest population density of vExperts on the planet, blog.vmforsp.com/2013/05/2013-vexpert-group-by-the-numbers. VMware vExpert 2015 recipients have been named, and I'm relieved to see I've made the list again this year!